Motherwell striker Louis Moult believes new manager Mark McGhee deserves credit for an improvement in their fortunes since his appointment. 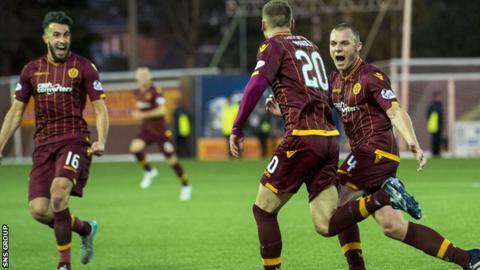 The Fir Park side earned their first win since McGhee took over courtesy of Moult's solitary goal against Kilmarnock on Saturday. The 23-year-old says hard work on the training ground is paying dividends. "I think there's a bit of a change in our play, we're a little bit more patient on the ball," said Moult. "That's been effective. People are taking a touch and relaxing a little bit more and I think that's helping us. "The manager has definitely given the forward players the freedom to try to impress and express themselves. That's obviously music to my ears as a forward. "I want to get on the ball and make things happen and score goals, so for us forward players it's brilliant. He's just told us to go out and enjoy ourselves and you can see that in a few of the boys." But the emphasis has not been solely on improving in an attacking sense. Perhaps informed by the work done with the national team, led by Gordon Strachan, Scotland assistant McGhee has also focused on improving the players' understanding of how to operate as a unit, with and without the ball. "We've worked a lot on shape," acknowledged Moult, who has scored six goals this term. "Off the ball we look fantastic at the minute. Even against Celtic and Aberdeen, the shape was fantastic and again against Kilmarnock it was good. It's just when we do get the ball, can we cause a few more problems and finish teams off? "I think if we add that to our game we'll be a real force to be reckoned with. "We've been doing a lot of shadow play. It's proving to be massive. When we haven't got the ball, we're looking out for each other and filling in the gaps so players can't play through us." Motherwell have now taken four points from the three games in which McGhee has been in charge and face Inverness Caley Thistle this weekend. "We've got to try to put a run together," admitted Moult. "We went through a bit of a tricky spell, but hopefully we've come through that now and let's go unbeaten for a few games. "We don't want (to be involved in another relegation battle) and I believe we won't be - I know for a fact we won't. As long as we keep working hard, we'll get rewards."